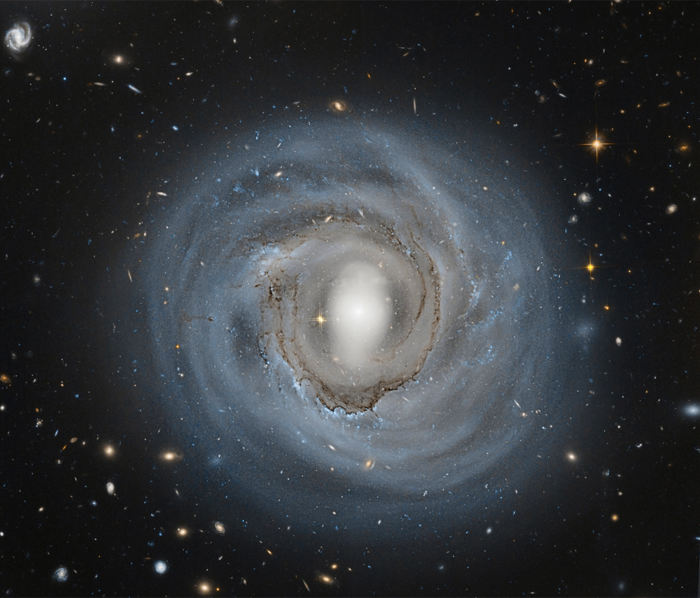 How far away is spiral galaxy NGC 4921? Although presently estimated to be about 310 million light years distant, a more precise determination could be coupled with its known recession speed to help humanity better calibrate the expansion rate of the entire visible universe. Toward this goal, several images were taken by the Hubble Space Telescope in order to help identify key stellar distance markers known as Cepheid variable stars. Since NGC 4921 is a member of the Coma Cluster of Galaxies, refining its distance would also allow a better distance determination to one of the largest nearby clusters in the local universe. The magnificent spiral NGC 4921 has been informally dubbed anemic because of its low rate of star formation and low surface brightness. Visible in the above image are, from the center, a bright nucleus, a bright central bar, a prominent ring of dark dust, blue clusters of recently formed stars, several smaller companion galaxies, unrelated galaxies in the far distant universe, and unrelated stars in our Milky Way Galaxy.